Most of us won't ever visit space. But space has been brought to us, in the form of images and data collected for years by spacecraft, satellites and telescopes. Here are the 10 best online, interactive apps that allow you to explore space from your computer. Grab your mouse, Ensign — you have the helm. Flying from planet to planet, I pause to admire the view of Phobos passing across the face of Mars. (Whoa.) JPL's stunning 3D visualization—which requires you to download a free app—allows you to explore the solar system both in time and space. You can pick any date between 1949 and 2049, which is an especially useful feature if you choose to do a "ride along" with an historical spacecraft. When I select "Pioneer 10" from the destination menu and choose "Jupiter flyby," it's suddenly December 3, 1973 and I'm hovering next to a 3D model of the probe, 617,000 miles from its destination and closing. Arizona State University, which developed the Lunar Reconnaissance Orbiter Camera (LROC), has assembled 10,581 images, collected over four years, to create this spectacular northern polar mosaic of the Moon's surface. According to ASU, this is "likely one of the world's largest image mosaics in existence, or at least publicly available on the web, with over 680 gigapixels of valid image data covering a region of the Moon (0.98 million sq. miles) slightly larger than the combined area of Alaska and Texas — at a resolution of 2 meters per pixel!" That level of detail is apparent as you click and zoom your way around sites on the lunar surface. Every rock, groove and shadow is visible, such as this image (above) of the tracks made by a boulder rolling down the central peak of Hayn crater. I've seen quite a few interactive views of Mars, but in terms of detail my favorite is this one created by JPL. It's a scaled-down version of a full-circle view that combines nearly 900 images taken by NASA's Curiosity Mars rover. The view is centered toward the south, with north at both ends. It shows Curiosity at the "Rocknest" site where the rover scooped up samples of windblown dust and sand. Curiosity used three cameras to take the component images on several different days, between Oct. 5 and Nov. 16, 2012. One version of the panorama has been white-balanced to show what the scene would look like under Earth lighting conditions, which is helpful in distinguishing and recognizing materials in the rocks and soil. You can also opt for the "raw color" version, which shows illumination effects from variations in the time of day. You can pan and zoom across either a cylindrical or panorama view. I recommend panorama, since it offers the option of seeing the breathtaking landscape in full-screen mode. Among the many apps and websites that were created to commemorate the 45th anniversary of the Apollo 11 lunar landing, this one is a standout. The First Men on the Moon recreates Eagle's descent, using spaceflight video footage, communication audio, mission control room conversations, text transcripts and telemetry data. The result is a meticulously synchronized audio-video presentation. It begins with hearing the words of Buzz Aldrin, while simultaneously viewing the moon through the lunar module window. Moments later, you hear capsule communicator Charlie Duke inform flight director Gene Kranz that the astronauts are on schedule to start the descent engine. Throughout the simulation you can jump to key moments in the timeline, including computer alerts, the "Go/No Go" polls in the control room and, finally, the landing itself. It's a front row seat to history… and it's a nailbiter. I recently wrote about this visualization, but it's well worth a second mention. Dave MacClean, a faculty member at the Centre of Geographic Sciences in Nova Scotia, created an interactive world map of more than 650 pictures that the astronauts aboard the International Space Station have shared on Twitter. Each locator pin is color-coded to indicate which astronaut took the photo. Just left-click on the pin to see the image and a link to the original tweet. And, as a bonus, the map shows you the location of the space station in real time (give or take a minute). This interactive flash animation is a stunning, modern version of the classic video Powers of Ten. Moving the toggle takes you from the edge of the observable universe and through distant galaxies until you arrive at Earth, and continue your voyage through inner space to the sub-atomic level. Along the way, clicking on individual items brings up descriptive information. Another amazing 3D visualization that uses NASA's "Eyes On" app, this one allows you to view the space agency's fleet of Earth observation satellites in real time. Click on any satellite to go on a virtual fly along and learn more about its mission. A menu lets you see different versions of the Earth — carbon dioxide levels, global temperature, etc. — created from data collected by the instrumentation aboard the satellites. Spacewalk sticks you in a spacesuit to navigate and explore a richly detailed recreation of the International Space Station. Patience is a virtue here — thrusting too fast sent me spinning head over heels (does a spacesuit have heels? ), until I collided with one of the modules. There's a "multiplayer" option—though, honestly, I'm not sure what you would do with other players other than wave at them, or perhaps play an orbital version of bumper cars. Spacewalk has recently been optimized for use with Oculus Rift, but you can still download the original version. It's a wild ride. It's getting awfully crowded up there. In addition to the more than 1,000 active satellites that are orbiting the Earth, more than 21,000 pieces of orbital debris larger than 10 cm are known to exist. These pieces of space junk collide with each other, generating additional debris in the form of high-velocity fragments that can travel as fast as 35,000 miles per hour. You can pay a virtual visit to our orbital junkyard, courtesy of this interactive, 3D visualization (image above) made by Alex Rasmussen. Points marked in green represent active satellites. Points marked in gray are inactive satellites that are still intact. Points marked as red are tracked pieces of space debris. Orbital Objects is best viewed on Google Chrome. Use up and down arrows to zoom in and out, and the mouse to rotate. Another visualization currently under development by Satellite Spy uses the Google Earth plugin to map thousands of near-Earth objects (above). Click on each one to identify the piece of space debris and its source. The most recent—and most astonishing—addition to NASA's "Eyes On" series takes you 1,000 light years away from Earth to explore the stars in our galactic neighborhood. 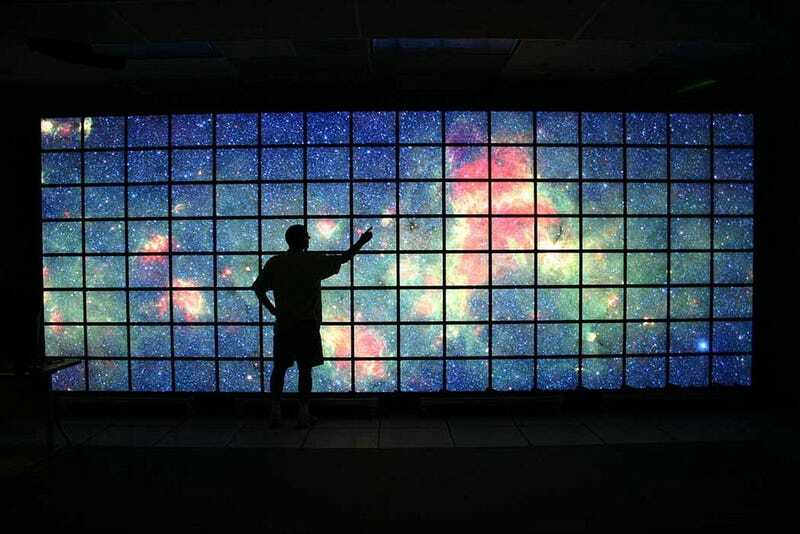 The data used to create the simulation includes 1,061 stars with known exoplanets—1,743 exoplanets to be precise. Click on a star to zoom in. A menu of options includes a visualization of the star's habitable zone and an onscreen comparison with our own solar system. Remember that awesome "stellar cartography" room (above) aboard the USS Enterprise in Star Trek: Generations? You now have it on your desktop.